You are here:Home Articles Why do I need to warm up before I sing? We know of a lot of singers who just go and sing a gig completely cold, without having done any warm up beforehand. We also know a lot of these singers get into difficulty very quickly, because they have not warmed up their voices before they sing. The following four points are fool-proof reasons why you need to warm up before you sing. Just like the marathon runner, you need to prepare your muscles for the workout they’ll get during your practice, gig, or general singing around the house. Warming up will allow the muscles to work to their fullest potential during the time you are singing. 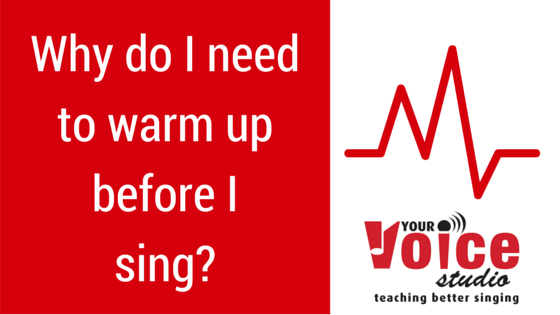 Warming up will help you find your vocal balance quicker than singing songs will. The exercises are tailored to your voice to help you overcome any imbalances that you may be experiencing at the time. If you are at your optimal vocal balance, then are you are more likely to be able to sing and perform at your fullest potential. If you are out of balance, your voice might feel breathy or squeezed, which in a concert or gig setting is not what you want! It can help you to sing for longer! It can also help to prolong the time you can spend singing without incurring damage to the voice. If you don’t warm up your voice before you sing, chances are you’ll burn out before you’ve reached your goal for the day. However, if you warm your voice up thoroughly before you sing, then you may even exceed the goal you have set for yourself. You can help yourself to avoid injuries…..
Not warming up your voice before a gig or concert can also lead to other problems. Again, think like an athlete. They wouldn’t risk getting leg, ankle or hip injuries from running without having fully warmed up and stretched out their bodies, would they? So why would you risk vocal injuries that are preventable? Singing with a “cold” voice (meaning not warmed up) can lead to things like pushing for the high notes, or a breathy tone in the bottom. This, in turn, may lead to other problems with the voice, such as the development of polyps or nodules, which are much harder to get rid of than you think. If this goes on for a long period of time, you may even require surgery on your voice to enable you to sing again. Warming up your voice will also give you the essential 10 minutes of “me time” you need before the gig or concert to prepare yourself physically and mentally. Singing a familiar set of scale patterns and exercises will relax your mind and help to take away any stress or anxiety you might feel beforehand. Since it helps you to relax, then when you do go on stage, you are free to convey the performance of the songs without worrying about why you can’t hit that high note so easily or that it feels a bit forced. So, really it’s not JUST about getting the voice ready to sing, it’s also about getting YOU ready to sing at your fullest potential. A good teacher will give you a thorough warm up when you sing, and if you are doing a gig soon, ask them to tailor it to ensure all of the notes you are singing are included. You should always follow these warm ups exercises before you sing, even if you are practising in the house, or singing as you clean the bathroom. We can’t stress enough the importance of warming your voice up before you sing. It can act as a preventative measure against any vocal health issues that you might experience, and it will also relax your mind into the pattern you need to sing and perform well. Not to mention keep you at your optimal vocal balance! What are your experiences of warming up before you sing? Do you swear by a specific routine? Or have you had negative experiences if you haven’t warmed up? Share with us in the comments below, or on our social media channels!